Chris Hughton has finally had a rub of the green, managing Norwich City into a good run of form as they are now unbeaten in 4 games in all competitions. The mid-week win against Tottenham sees them progress to the quarter finals of the Capital One cup and they needed to build on this to push them up the Premier League. Stoke had drawn 6 of their last 9 games and would’ve been hoping to pour misery into Carrow Road, but a solid defensive performance by the Canaries meant Bradley Johnson’s first half header was enough to seal the victory. It was a scrappy game, but it was a well deserved win for Norwich who were never too troubled by Stoke City. 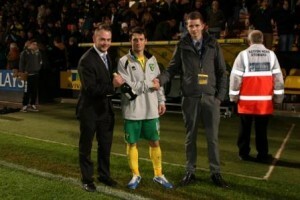 The Anglian Home Improvement’s Man of the Match was awarded to Wes Hoolahan for his energetic performance. This Saturday the Canaries travel to the Madjeski stadium to play Reading; what will the score be?